Poor public transportation can leave some people feeling stranded. Schedules must be made to coincide with the schedule of public transport. People are forced to endure long wait times and long routes to their destination. Sometimes taking public transportation is not even an option. Personally, I can’t get home on MARTA as the rail line does not go to my city. I am bound by the limitations of MARTA. (3) This type of architectural exclusion is a stress for the people that face it. Public transportation is a system that is supposed to fulfill the needs of the public. Instead of doing so, the public transportation systems limits those who rely on it. 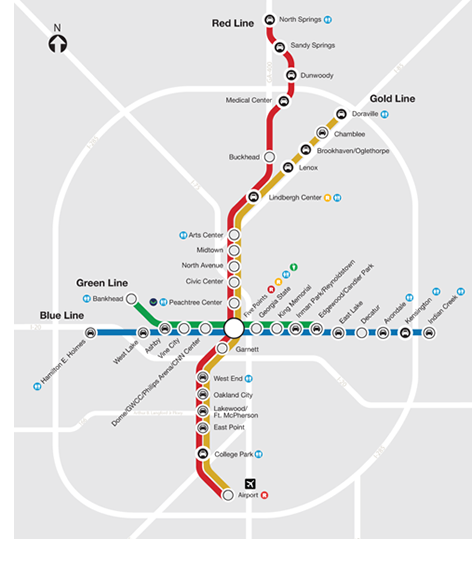 MARTA rail line and stations.